The United Nations on Tuesday called for $184 million (163 million euros) to help more than 400,000 people displaced by the separatist conflict in western Cameroon. "Violent clashes in Cameroon between the military and armed separatists over the past 13 months have forcibly displaced thousands, including across the border into Nigeria," the UN refugee agency (UNHCR) said in a statement. "The humanitarian situation continues to deteriorate. And there are fears now that more people will become displaced over the coming months." The UN estimates that 437,000 have been displaced in Cameroon itself, while over 35,000 have fled across the border into Nigeria -- a number that is expected to rise as fighting continues. Of the estimated aid needs, $35.4 million is needed urgently, "for critical life-saving assistance," the UNHCR said. 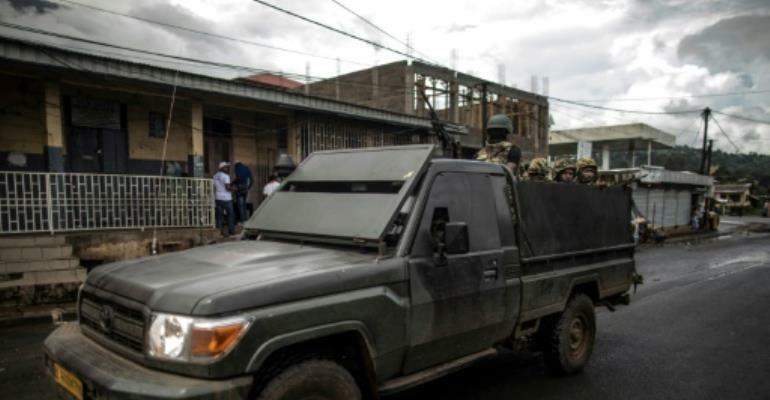 The Northwest and Southwest Regions of Cameroon are in the grip of an armed campaign launched by anglophone separatists in October 2017. Around a fifth of Cameroon's population of 24 million are English-speakers. Their presence can be traced back to the colonial era. After World War I Germany surrendered Kamerun, its principal colony in West Africa, which was then taken over by Britain and France. A year later, the British colony also gained independence. Some of the English-speaking areas opted to join newly-formed Nigeria, while others chose to join the federation of Cameroon. English-speakers have chafed for years at perceived discrimination in education, law and economic opportunities at the hands of the francophone majority. In 2017, as the authorities refused demands for greater autonomy for the Northwest and Southwest Regions, the anglophone movement radicalised.